The Billy Graham Rapid Response Team (RRT) trains God’s people for grief ministry and deploys crisis-trained chaplains to provide emotional and spiritual care to those affected by man-made or natural disasters. To meet the critical need for emotional and spiritual care following disasters, the Rapid Response Team (RRT) currently has chaplains in the United States, the US Territory of Puerto Rico, Australia, Canada and the United Kingdom. These approved volunteer chaplains are carefully selected and prepared to demonstrate the compassion of Jesus Christ, and appropriately share God’s hope through the One who “heals the brokenhearted and binds up their wounds”, Psalm 147:3. Begin by praying about becoming a volunteer chaplain to serve with the Rapid Response Team. Complete a Chaplain Application Packet. Plan to attend a Sharing Hope in Crisis seminar and two Critical Incident Stress Management courses. These courses are available at our RRT national training conference and elsewhere. Sharing Hope in Crisis is now available online. As a Rapid Response Team chaplain, you will be invited to deploy according to your availability, as needed by RRT for disaster response. When you first arrive you will be greeted by a seasoned Chaplain Coordinator who will get you settled and oriented to that specific site and deployment. Chaplain Coordinators are the RRT on-the-ground-leadership that the RRT office coordinates all things through. Each of them have vast experience in disaster response and ministry. They will make sure that your week deployed is full of ministry, that you are doing well and will coordinate all logistics and ministry. The “Camp” is where you will live and work out of. As stated in the Chaplain Application Packet, when a group of people live together in a ministry situation, things like cleaning, washing and such have to happen. Some places have cook crews, sometimes we help; each location is different and no two deployments are the same! Be in the Word so you are spiritually strong. Be in prayer and have a prayer covering in place by those who know what you are doing. Be ready to walk! You can expect to walk 2-3 miles a day while ministering. Have a plan in place to contact your family back home so relationships stay strong. Don’t deploy if you are dealing with unresolved stressful activities or decisions in your life. What is the mission of the Rapid Response Team? What is unique about the Rapid Response Team? BG RRT is part of a globally recognized ministry. It is non-denominational, thereby widely accepted. It provides Emotional and Spiritual Care from a Biblical perspective along with clinical understanding. Cadre of chaplains specifically trained in crisis intervention in the disaster setting. Scope of church and ministry relationships globally. Provides applicable training for the local church as well as for chaplains. Supported in prayer by a global prayer network. Who would make a good chaplain? Rapid Response Team Chaplains are to be selfless people who are emotionally and spiritually mature and able to share God’s hope and comfort with survivors of tragedies. If not already trained in chaplaincy or crisis intervention, approved applicants will have two years to complete 3 training courses.. Chaplains are also to be solidly grounded in God’s Word and comfortable praying, when appropriate, with survivors. What kind of training should chaplains have? The RRT requires three training classes plus, upon approval as a chaplain, one free online orientation training every two years. The RRT Seminar, Sharing Hope in Crisis, can be taken live in a one day seminar, or online to be done at your own pace either prior to approval or following approval as a chaplain. Once approved, the online orientation training teaches the Chaplain what is expected while on deployment and is required before the first deployment. Over the next two years, 2 Critical Incident Stress Management (CISM) courses, offered by the International Critical Incident Stress Foundation (ICISF) should be completed. CISM courses taken prior to RRT Chaplain approval will be accepted as long as they are approved by RRT. For a complete list of approved CISM courses for RRT, click here. Where do I get the CISM training? In addition to these courses being offered at the annual RRT Chaplain Training Conference, Chaplains or potential Chaplains can also complete courses presented through ICISF (www.icisf.org). Community Fire and Police Chaplains often know the classes offered locally through ICISF that may qualify for RRT CISMS courses. For a complete downloadable list of CISM courses approved by RRT, see above “What kind of training should Chaplains have?” and click the link. How do I apply to be a chaplain? Every candidate must complete a Chaplain Application Packet, which is downloadable on the website. References listed on the application form will be contacted. Please note that completing a training (CISM or Rapid Response Team training) does not automatically guarantee your acceptance as a Billy Graham Rapid Response Team chaplain. Chaplains serve on a volunteer basis as they are able. This is not a paid position. Do you furnish room and board while on a deployment? Room and board are furnished to chaplains who deploy with the Billy Graham Rapid Response Team. In physical disasters (fires, floods, tornadoes, hurricanes, etc. ), this usually entails sleeping on cots in schools or churches. Do you pay for transportation to a deployment site? No, the Billy Graham Rapid Response Team does not pay for transportation to or from a deployment site. 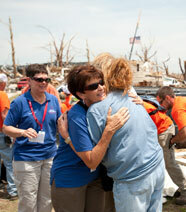 For this reason, we try to bring in chaplains from within a 200-mile radius of a disaster if possible. What are the conditions in which chaplains are ministering? Every deployment is different, based upon the type of disaster and the severity of the devastation. Chaplains can expect long days of standing and walking, and emotionally and spiritually intense conversations with survivors of tragedies. Chaplains can also expect opportunities to bring hope and love into the lives of people who are going through some of the darkest days they will ever experience. The introduction of the Chaplain Application Packet outlines the expectations. Will I be all by myself when I deploy? No, a trained and experienced chaplain coordinator will be on-site to guide volunteer chaplains and lead them through an orientation. Chaplains are sent out to minister in pairs. How am I notified of a deployment? When a deployment occurs, the Billy Graham Rapid Response Team will send an email to chaplain volunteers notifying them of the deployment and asking for prayer. The Chaplains are also asked for their availability during the expected duration of the deployment. 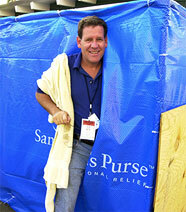 What are the benefits of being a Billy Graham Rapid Response Team chaplain? Thanks to the name and reputation of Mr. Graham and the Billy Graham Rapid Response Team, we are able to bring chaplains into disaster areas that most people wouldn’t be able to get into on their own. If you have a burden to offer hope in the midst of tragedy, your best chance of being able to minister in these areas is as an approved member of an established chaplaincy organization such as the Billy Graham Rapid Response Team. Another benefit is what it brings you in your daily Christian walk and in your ability to minister in the local congregation.